A recent interaction spotlighted ongoing efforts by the two sides to make advances in their defense ties. This week, Russian vessels paid another scheduled goodwill visit to the Philippines. The interaction between the two sides, the first of its kind in 2019, spotlighted the continued activity within the development of Russia-Philippine defense ties under Philippine President Rodrigo Duterte’s perceived “pivot” to Russia as part of his wider independent foreign policy. As I have noted before in these pages and elsewhere, one of the consequences of Duterte’s so-called independent foreign policy, which seeks to boost the country’s outreach with countries like China and Russia, has been the slow but sure development of Russia-Philippine defense relations, despite the challenges that still exist. That includes the maritime realm, where interactions have included visits by Russian vessels to the Philippines and talk about Moscow providing some maritime-related equipment and expertise. 2018 had continued to see some inroads on this front, with a case in point being the first-ever port visit of Philippine naval vessels to Vladivostok in Russia in October. Such interactions between the two sides are continuing into 2019 as well, and this week, the defense aspect of the relationship has been in the headlines again with the visit of Russian vessels to the Philippines. Three Russian naval ships arrived on Sunday for a five-day goodwill visit that was set to last from January 6 to January 11. The Russian vessels – which consisted of the anti-submarine ship Admiral Pantellev, guided missile cruiser Varyag, and large sea tanker Boris Butoma – were expected to engage in a range of interactions during the visit. This included a welcome ceremony and port briefing, interactions with Philippine personnel, and exchanges and planned activities for them as well as their counterparts. 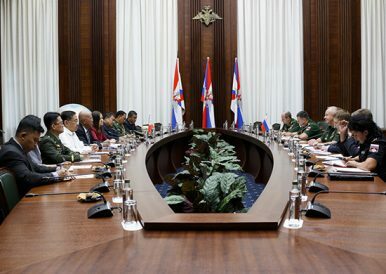 Statements from both sides cast the visit as evidence of both further collaboration between the two countries and their navies in their defense relationship as well as the state of activities for the new year, which offers new opportunities for ties. Philippine media outlets also emphasized certain interactions tied to the visit, such as the Philippine military chief Benjamin Madrigal Jr. boarding one of the Russian ships. More details will become available as the visit progresses and assessments begin to take shape after it concludes. Nonetheless, such interactions are important to monitor as both sides look to continue to make inroads in their defense cooperation to varying degrees into the new year and we continue to see the development of wider trends including Duterte’s foreign policy and Russia’s continued outreach in the defense domain in the wider Asia-Pacific region. Why Are Russian Warships in the Philippines? A look at the significance of the latest development in an expanding defense relationship. What’s in the New Russia-Philippines Military Pact?What’s in the New Russia-Philippines Navy Pact Chatter?What Would a First Philippine Navy Russia Visit Mean for Duterte’s Pivot?What’s Next for Russia-Philippines Maritime Ties Under Duterte?What’s in the New Russia Navy Visit to the Philippines?